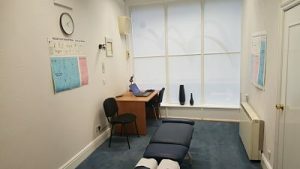 There are three treatment / consulting rooms available at the Taunton clinic, all served by a Reception area and customer toilets. The rooms are furnished & equipped to be very flexible with formal consulting areas, informal seating, treatment/examination couches etc. The Taunton clinic is manned by a receptionist during the day when the rooms are in use. Out of hours, we are covered by a virtual receptionist service. 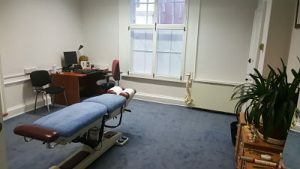 The clinic is on the ground floor and has parking for 6 cars. 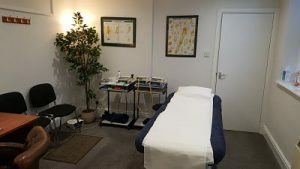 There are two treatment / consulting rooms available at the Newton Abbot clinic, all served by a small waiting area and customer toilet. The rooms are furnished & equipped to be very flexible with formal consulting areas, informal seating, treatment/examination couches etc. The Newton Abbot clinic does not currently have a receptionist and each of the rooms is served by a door entry system. This gives each practitioner control of running their own appointments and knowing who is waiting for them. All rooms at both locations have free wi-fi internet access for use with your laptop/iPad. As well as the rooms there is a kitchen for your use and there is a staff room in the Newton Abbot clinic. There are tea and coffee facilities available for staff at both practices.